This stuff is SO GOOD! 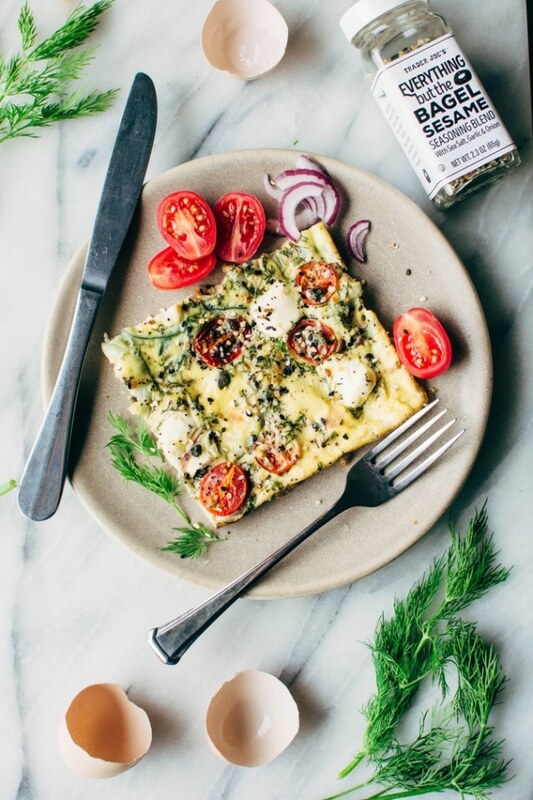 It perfectly mimics the flavor of an everything bagel, and it really makes these sheet pan eggs come together. If you don’t have a Trader Joe’s, or for some reason yours doesn’t carry this spice blend (SAD FACE EMOJI!) then you can totally make your own. This recipe from The Kitchn is super on point and would be a great place to start. 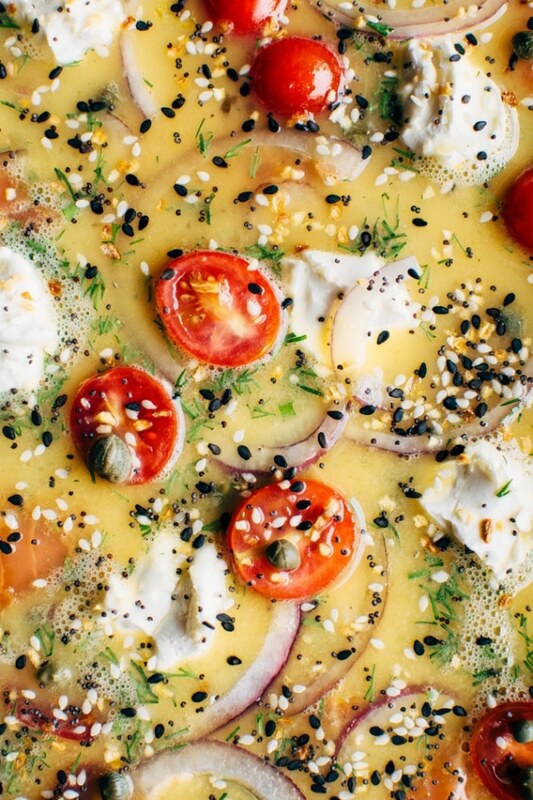 With this sheet pan egg recipe I decided to take the everything bagel thing to the next level and invite some other players that go FAMOUSLY well with an everything bagel. 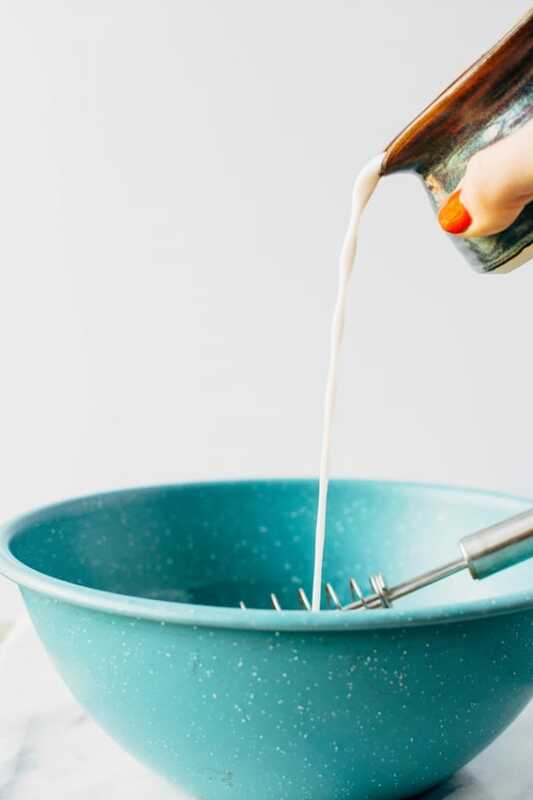 You can leave out the cream cheese if it’s an issue for you – that’s the only dairy used in the recipe, and I promise that if you do (despite my ever loving feelings towards it), that you’re still gonna love this easy breakfast! 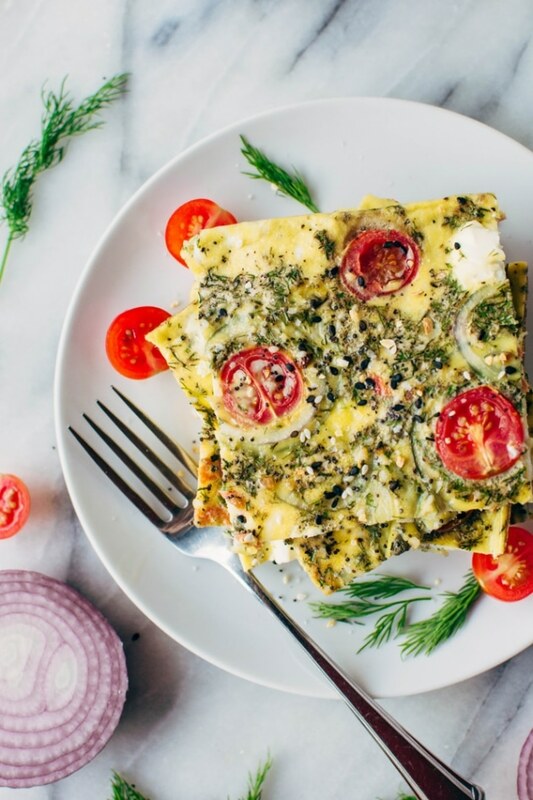 Sheet pan eggs are a super easy, time saving method for making a bunch of breakfasts in a matter of 30 minutes. Which pretty much making you a healthy morning breakfast NINJA // hostess with the absolute mostest when you’re brunching with a crowd. For the easiest clean up make sure you THOROUGHLY grease your pan (I made the mistake of going light on this for the first round of testing and it did not turn out pretty – so bad my usual dishwasher walked out on the job), or even BETTER use a Silpat non stick silicone baking mat if you have one. I will eventually cave and buy one – don’t ask me what I’m waiting for as they’re pretty much worth their weight in gold. 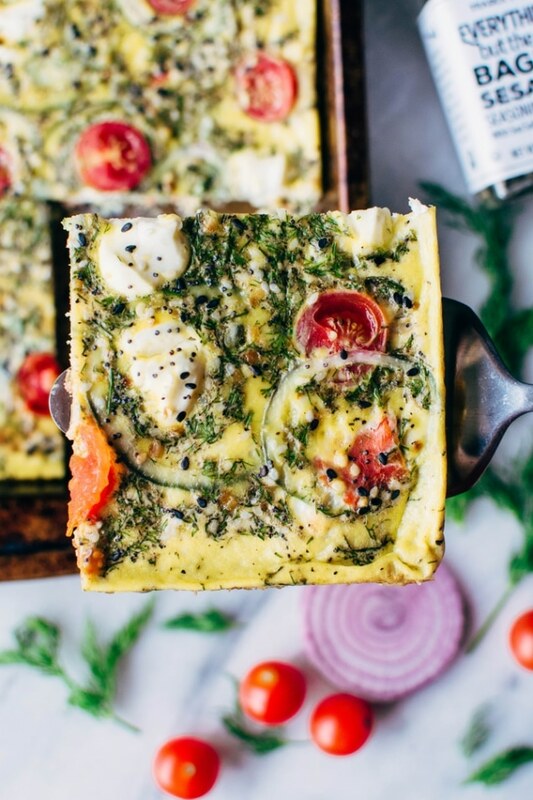 my favorite way to eat everything (but the) bagel sheet pan eggs with smoked salmon? Gently re-heated, over a bed of lightly dressed salad greens, with a scoop of sauerkraut on the side (for all the probiotic gut looove!). But you could also make a sandwich out of them with some of your favorite gluten free or paleo bread. Or gently re-heated and tucked into a paper towel for the road – they’re seriously so transportable and easy for a healthy breakfast on the go! Side note since I mentioned paleo bread – I just made the yummiest GRAIN FREE bread recipe and had my first breakfast sandwich that I’ve had in a loooong time. Would you guys be into a recipe for it? I’m kind of really pumped about the whole situation. I think I’m going to work on fine tuning it so I can share it with you soon! Everything (but the) bagel sheet pan eggs with smoked salmon are a super easy and healthy way to set yourself up for weekday breakfast success! Also the best possible way to indulge in your love of everything bagels WITHOUT eating a bagel. 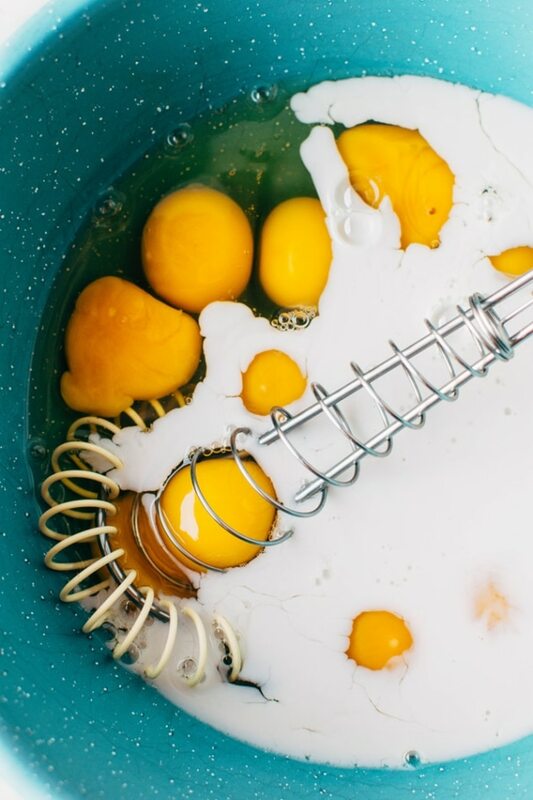 Whisk together the eggs with almond milk, salt, pepper and dill. Grease sheet pan generously with ghee, coconut oil or avocado oil using a paper towel (or use a Silpat baking mat). 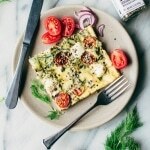 Pour eggs into sheet pan. Evenly distribute torn pieces of smoked salmon, red onion, capers, tomatoes, and dollops of cream cheese over the top. Sprinkle about 1 1/2 tbsp everything but the bagel spice blend. Bake for about 25 minutes, until eggs are set through the middle. Remove from oven, let cool and cut, serving with extra cherry tomato slices, raw onion and a sprinkle more of the bagel spice if desired. Yes ,yes,yes can’t wait to try this recipe. And yes your gluten free bread recipe would be AWESOME. I love this idea! 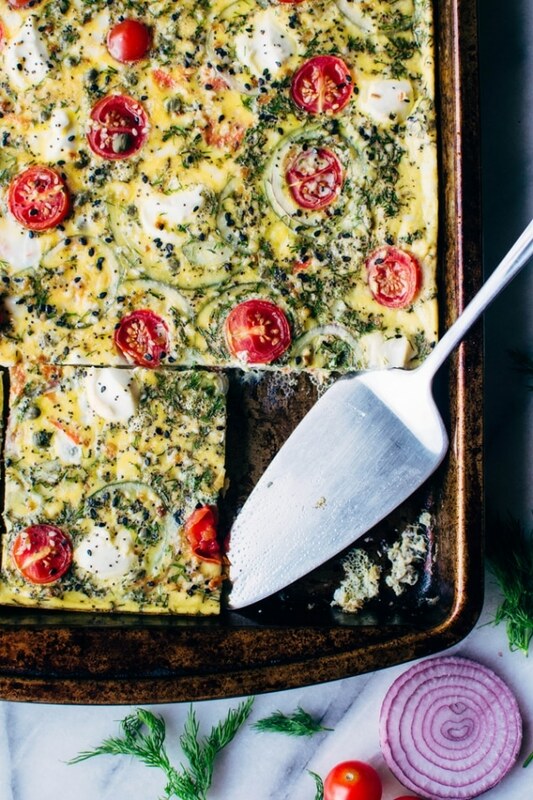 I’ve never made sheet-pan eggs before, but this is totally happening for my next brunch club. Also thank you for posting the link to the everything spice mix recipe. No Trader Joe’s where I live (so sad!) so I’ll have to whip up a batch of my own. Thanks for the recipe, this looks great! Katie! Thanks so much for checking out the recipe. This was my first foray at sheet pan eggs and I love them! I hope you do too 🙂 Major bummer that you don’t have a Trader Joe’s but that recipe I linked to is pretty much exactly the same thing, so you won’t be missing out. Enjoy and I would love to hear how they turn out for you!